Readers Question What does the size of a current account deficit / surplus say about the state of the economy? A current account deficit means that the value of goods and services imported is greater than the value of exports. A current account deficit requires capital / financial flows to finance this deficit. 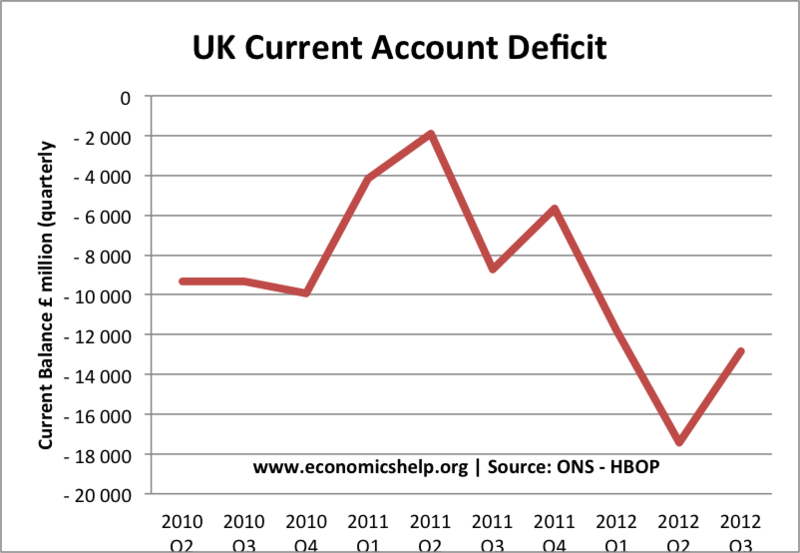 Despite the double dip recession of 2012, the UK has experienced a widening of its current account deficit. In particular, the UK has a large deficit in the trade in goods. Some economists argue that a large current account deficit is a sign of an unbalanced economy and could lead to a depreciation in the currency; others argue that if the current account is financed by capital flows, it shouldn’t be of great concern. 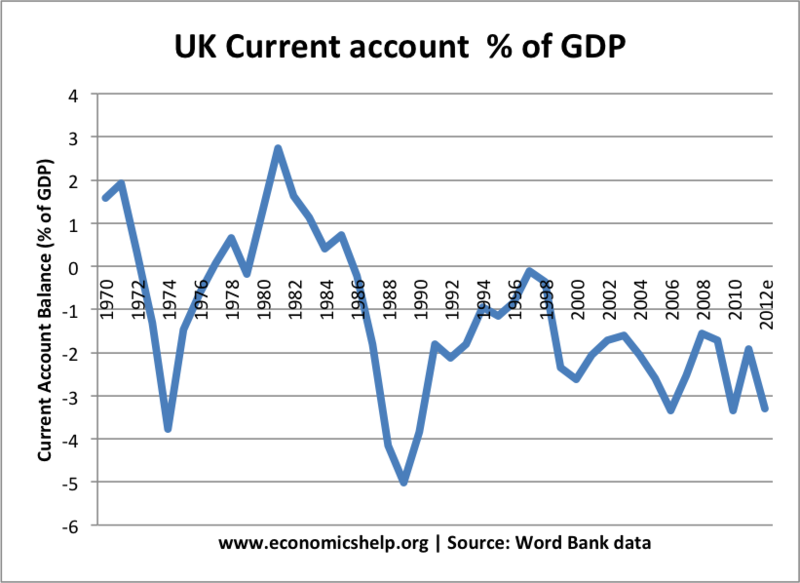 The UK has had a persistent current account deficit since the 1980s, and the current account deficit increased in magnitude in 2011 and 2012; it is unusual to have a bigger current account deficit in a recession. In a recession, you would expect a fall in consumer spending and therefore lower spending on imports. Usually, this fall in import spending causes a reduction in a current account deficit. If we look at previous recessions, we can see that the current account deficit fell during the recession of 1981 (in 1981 current account was a large surplus). After the recession of 1991-92, the current account deficit reduced. The biggest deficit occurred in the Lawson boom of the 1980s when consumer spending grew sharply. One of the most important features of the current account is that it is a sign of relative competitiveness. If we are importing much more than exporting and have a deficit, this is often a sign that the UK is becoming relatively uncompetitive. This is particularly noticeable for countries in the Eurozone with a fixed exchange rate. 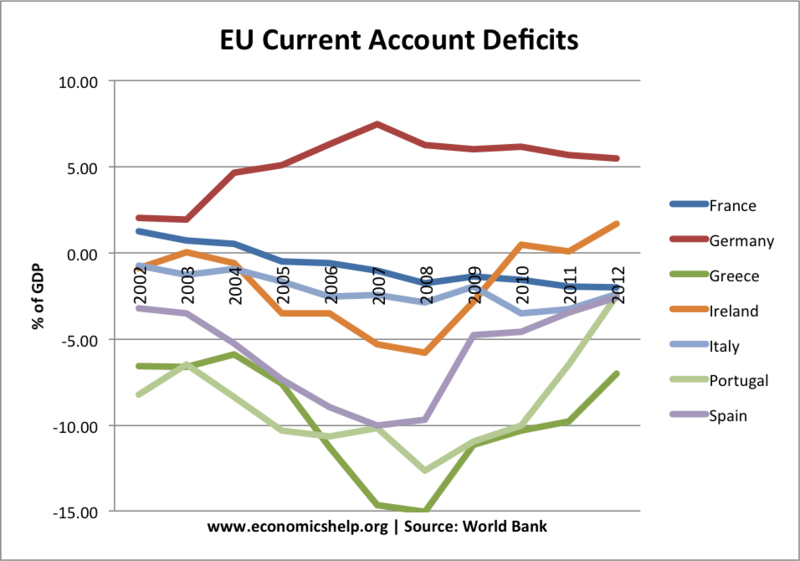 Southern European economies which became uncompetitive saw record current account deficits. Because prices and costs increased in southern Europe, it was more attractive to import from northern Europe. This caused a current account deficit. In the Euro, there is no scope for uncompetitive countries to devalue the exchange rate, therefore the imbalances can be large. In a floating exchange rate, a large current account deficit should put downward pressure on the currency. If the UK imports more than exports then this involves selling Sterling to buy foreign currency to be able to afford the imports. A depreciation of the currency will make UK exports cheaper, imports more expensive and thus help to reduce the current account deficit and reduce the disequilibrium. It depends on how it is financed. If a country is an attractive place for inward investment, then the capital flows to buy assets will offset the current account deficit and prevent a devaluation in the currency. However, this means that a higher proportion of assets are owned by foreigners. It can leave the economy more exposed if demand for buying UK assets dries up. A surplus is not necessarily a sign of a strong economy. 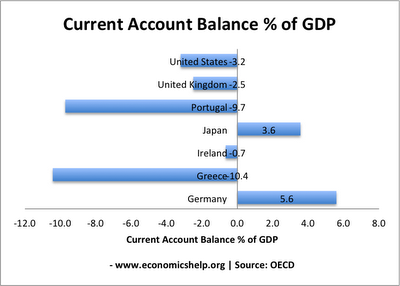 In recent months, many Eurozone economies have seen a dramatic improvement in their current account position. Large deficits have been transformed into a surplus. (for example, Ireland and Spain). However, this improvement in the current account has primarily been caused by a sharp drop in domestic demand. In Spain’s case, this fall in domestic demand has caused a recession and high unemployment. The ‘improvement’ is a reflection of a deep recession so this is not desirable. In the case of the US, they experienced a current account deficit of nearly 6% of GDP at the end of the 2000s economic boom. However, the downturn of 2008-09 helped to gradually restore equilibrium. The dollar has slightly fallen against the Chinese currency to slowly erode the disequilibrium that exists. Difficulties of collecting data. In the UK’s case, the balance of payments are hard to collect. In Q3 the current account deficit was £15,000 m, but net errors and admissions were £ 9177 m. Data are frequently revised at a later stage. Therefore, you need to be aware data for individual quarters may not be wholly accurate. Imports greater than exports so expenditure leaving the economy to buy imports. A current account deficit may be a sign economy is uncompetitive. Consumers prefer to buy cheaper imports than domestic consumption. The benefit of a current account deficit is that it allows higher levels of domestic consumption because we are buying from abroad. A deficit may occur due to high growth and strong consumer spending – rather than uncompetitiveness. A devaluation in the exchange rate could restore competitiveness and improve current account. But, would devaluation hurt or help the economy? 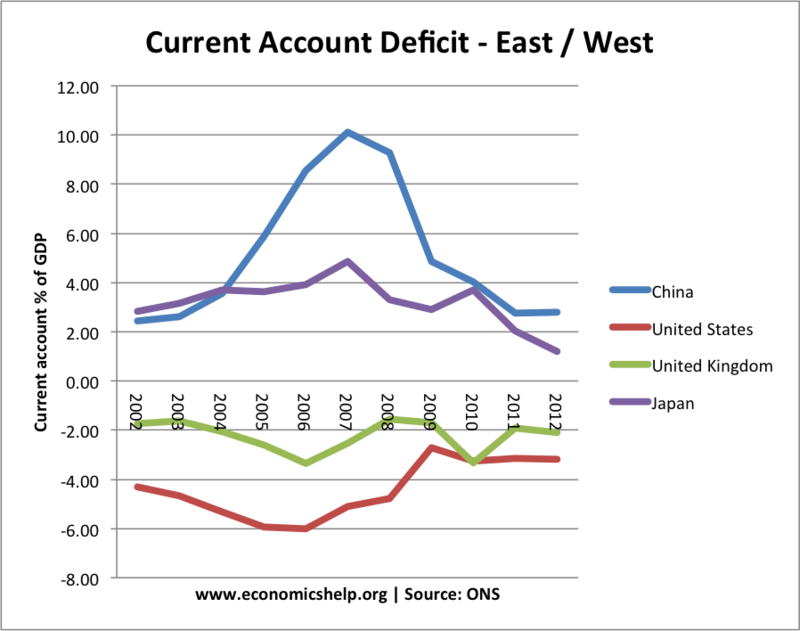 How important is the current account deficit? The current account deficit is an important signal of competitiveness and the level of imports and exports. A large current account deficit usually implies some kind of imbalance in the economy, which needs correcting with a depreciation in the exchange rate and / or improved competitiveness over time. However, it is not straightforward a current account deficit can often be reduced naturally over time as capital flows cause revalution in the exchange rate. The biggest concern for a current account deficit is when it is financed by borrowing, but a crisis of confidence causes this borrowing to dry up. (for example, in the case of Iceland). This can cause a dramatic drop in the exchange rate, adversely affecting living standards. In the case of the UK, the current account deficit at this stage of the economic cycle is cause for some concern. If it persists, we are likely to see a depreciation in the exchange rate. Also, it is a sign the economy would benefit from boosting exports – but, given Euro-recession this is easier said than done. This entry was posted in A-Level, trade. Bookmark the permalink. Clarifies some things for me. Good post.